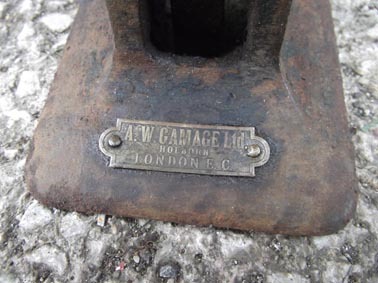 This database is for vintage and classic Tangye vehicle jacks. 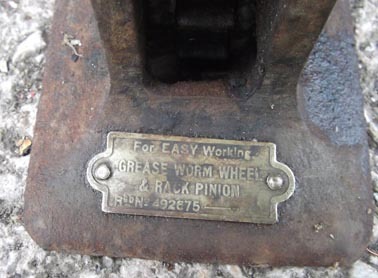 Many of the photos and comments have been gleaned from Ebay and other sites. 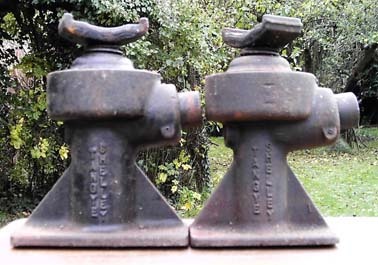 I would be pleased to add photos and comments from anyone who has information on these jacks. 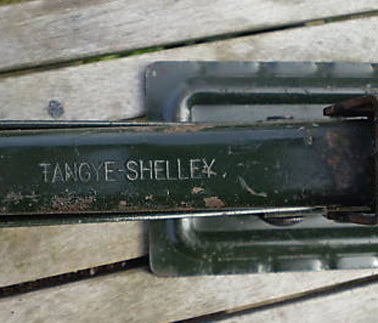 Tangye bought the Shelley business, probably in the late 60s/early 70s. 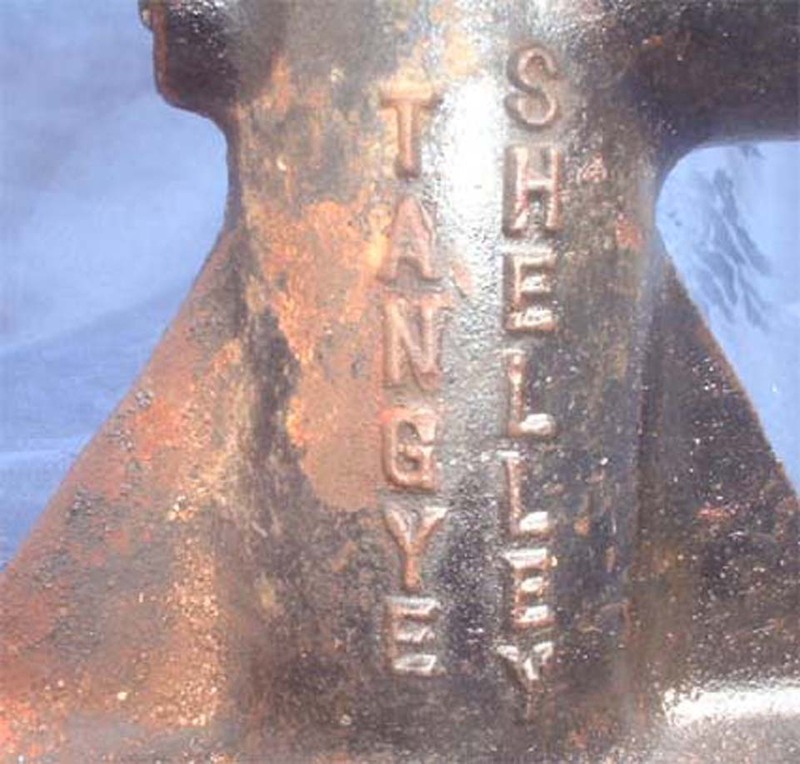 Some Tangye jacks have both names cast into them and are, therefore, also shown in the Shelley Database. 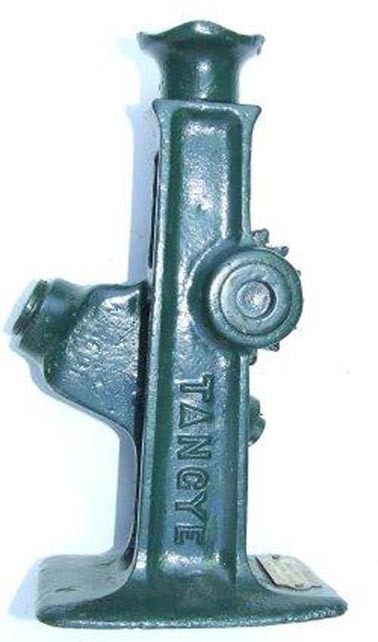 Most Tangye jacks are now old. I would recommend that they are now used only for display purposes. 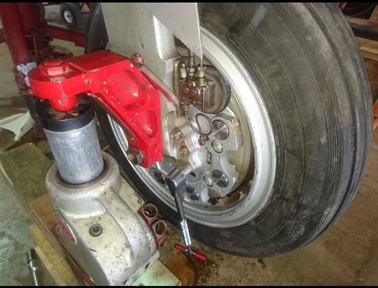 If one is used for lifting a vehicle, the operator should never put them self underneath the supported area without additional load bearing equipment in place, such as block of wood. Never use bricks for this purpose. Last updated 21 March 2019. 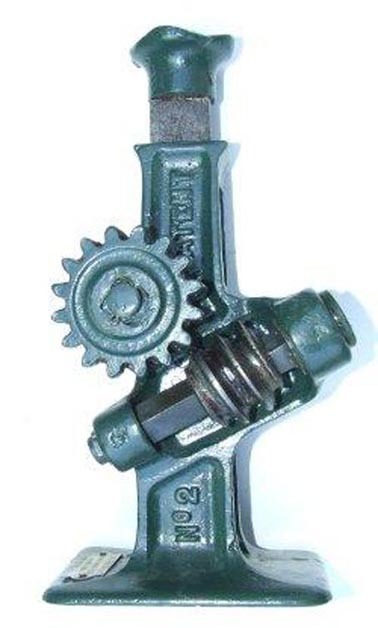 Single screw jack. 19cm retracted and 29cm extended. Base is 11cm x 8cm. 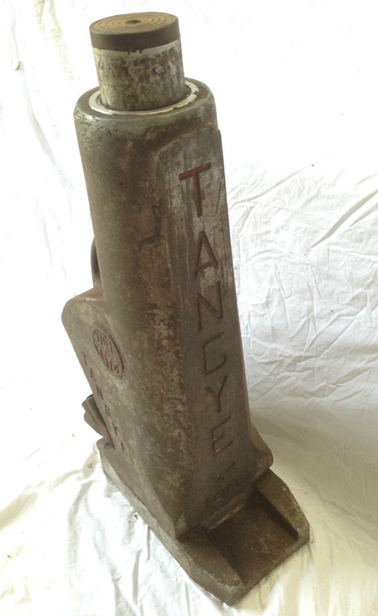 Cast TANGYE on one side and No. 1 LI - 6AR on the other. Cranked handle as shown in last 2 photos. 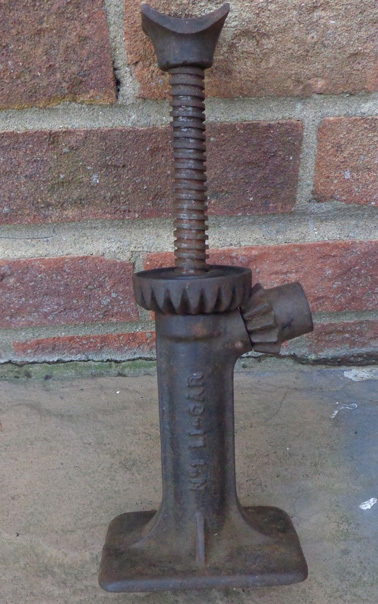 This is another unusual rack and pinion jack marketed by Gamages of Holborn London. It stands 12" high and extends to 17.5". The crank has a 1/2" sq drive. Cranked handle probably similar to the Type 2. 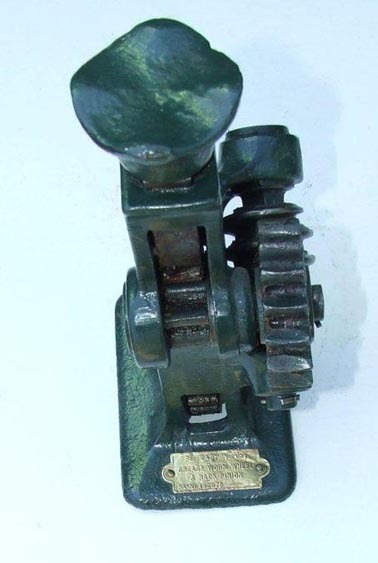 This jack is cast TANGYE on the handle and THE R.L on the body. Only other details as shown in the photos. The final photo shows a slight variation with 8 1/2" below the RL and a broader jacking saddle. 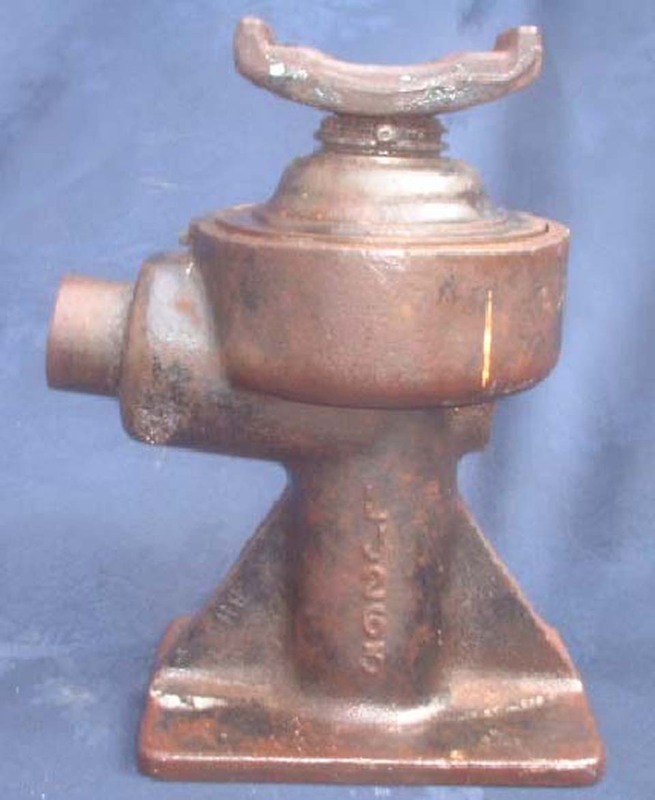 This jack is cast TANGYE on one side and 23DL on the other. The base is 4" x 5". 8.5" closed and 19" extended. The jack measures 7.5" retracted and 15.5" extended. It weighs 10.5 lbs. It is dual screw. The jack base is curved across its width, presumably allowing it to tilt slightly during the vehicle lifting process. Photos courtesy of Mike Nicholls. My own LJ263 also has the code 9.D.15 cast into the right hand gusset of the bottom photo. This appears to be in a similar sequence to another jack listed above. I am trying to ascertain if these codes are for land Rover jacks. All information welcome. For comparison the third photo shows the LJ263 and LJ264 alongside. The LJ264 (left of the two) has a larger base measuring 6" x 3.5". The LJ 263 base measures 5" x 3.5". Photo and information courtesy of NewMoody. Land Rover Series and early Range Rover. The jack measures 7.75" retracted and 15.5" extended. Supplied with the Series 3 Land Rover circa 1981. Also issued with the Land Rover (Defender) 90 from 1983. 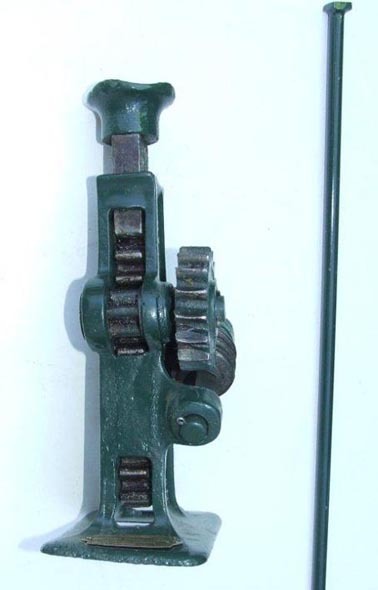 I believe this was the only scissor action jack supplied by Tangye Shelley. Supplied with the Triumph TR4A, TR5, TR250, TR6 and Dolomite. 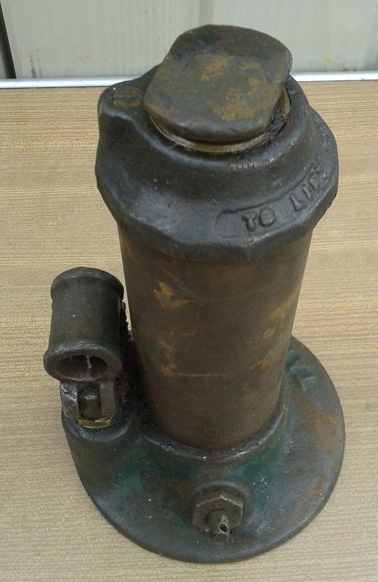 Single hydraulic piston with manual screw extension. 2 ton lifting weight. 7 1/4" closed and 16 1/2" extended. 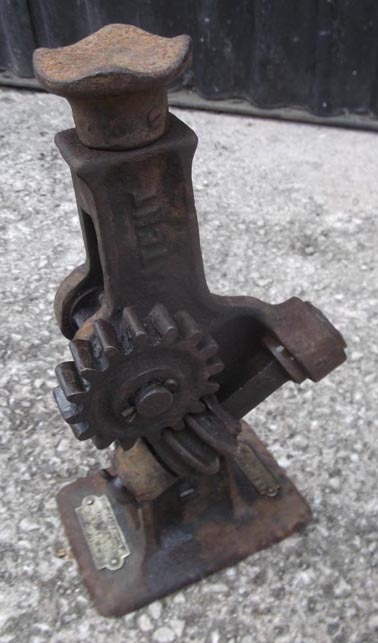 Single hydraulic piston with manual screw extension. 4 ton lifting weight. 9 7/8" closed and 22 3/4" extended. No details known other than shown in the photos. 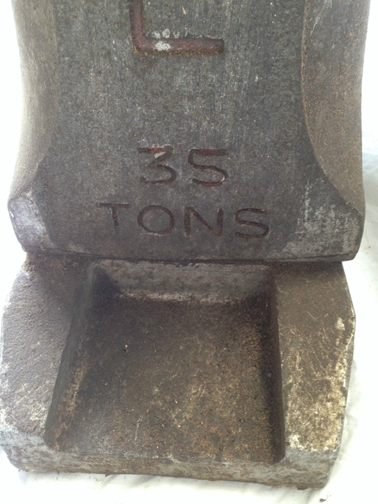 Label on the top says 6.5 TONS 3' 2" LIFT HYDRAMITE MODEL E TANGYE LTD BIRMINGHAM ENGLAND. As shown in last photo. 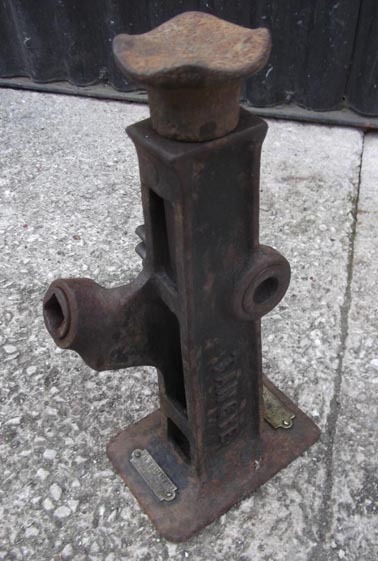 15 ton aluminium cast jack. It is 10" closed. Base is 10" x 5". It uses a 5/16" Allen key to operated the valve. 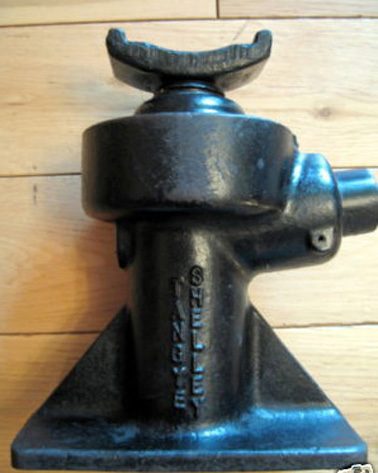 25 ton aluminium cast jack. Model No. 1625. It is 26.5" closed and 42.75" extended. Width is 28.7"" and depth is 9.4". 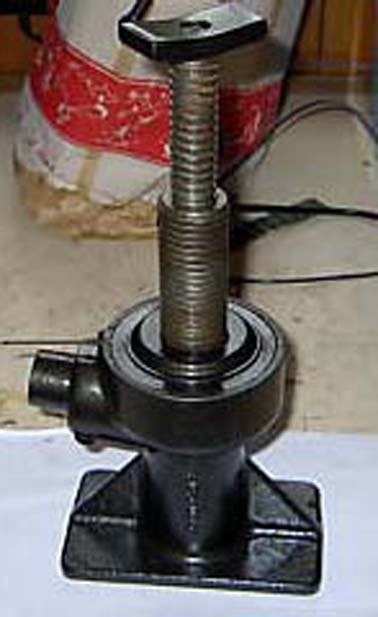 It uses a 5/16" Allen key to operated the valve. Final photo shows it or a shorter neck version in use with the English Electric Lightning Fighter aircraft. Photo courtesy the Lightning XS422 Group. English Electric Lightning Jet Fighter!!! 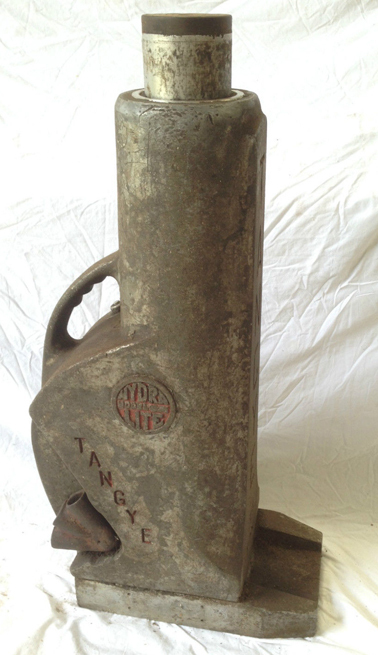 Marked Tangye Hydralift PS630. Details as shown in the photos. Final photo shows it in use with the English Electric Lightning Fighter aircraft. Photo courtesy the Lightning XS422 Group. Marked HYDRALITE TANGYE on one side, TANGYE on the end with 35 TONS below. 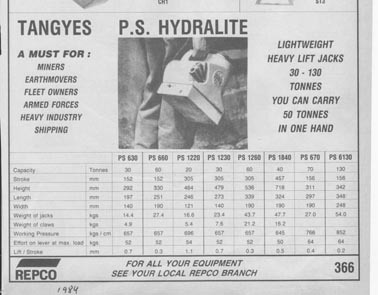 Marked HYDRALITE MODEL 650 on both sides and TANGYE 50 TONS on the end. Marked HYDRALITE PS660. Other details as shown in the photos. Labelled 88F) Tangye Euro Superline. 39cm high extended. 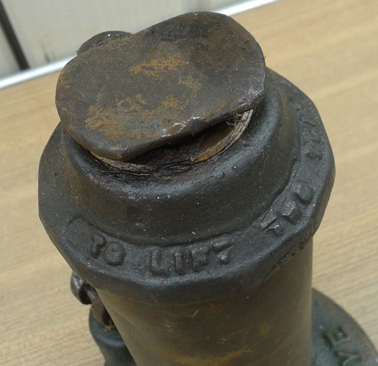 Single hydraulic piston with manual screw extension. No other details known. 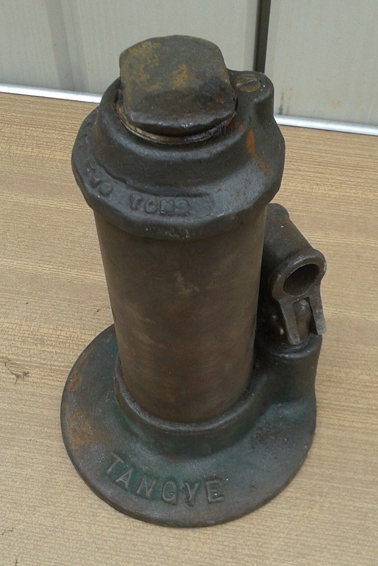 15 Ton hydraulic jack. Only details as shown in the photo. Labelled CK 15 Tangye LTD Euro Superline 15. Details as shown in photos. As shown in second photo. Details as shown in photos.